THE SARTORIAL cover-art purity of Introducing Gabriel Latchin Trio seems in tune with the pianist’s classic approach to this enduring format – and from the outset, the formative, stylistic influences of Oscar Peterson and Art Tatum are frequently evident across eleven numbers which balance four of Latchin’s compositions with seven, elegant interpretations of standards. A debut solo release from the first-call London-based sideman, it suggests a strong partnership with double bassist Tom Farmer and drummer Josh Morrison; the piano trio environment, as always, shining a shadowless arc light on every technical and artistic nuance from each player. They do it so well, evoking that exciting, first-time experience of the three-faceted acoustic alchemy of, say, Peterson, Bill Evans or George Shearing, and this straight-ahead recording certainly brings heartwarmed cheer. Amongst the increasingly colourful hybridisation of jazz, bebop remains effulgent in the right hands, and both Edgar Sampson’s Stompin’ at the Savoy and Cole Porter’s Can’t We Be Friends are interpreted with panache, the latter providing the space for Latchin’s precise, walking stride and carefree, high-line embellishments. The pianist’s ability, also, to compositionally complement some of those familiar time-honoured tunes is a great strength, his own brightly swinging, contrary-motion Carlora perfectly at home alongside a snappy reading of It Had To Be You. Classy gems abound here, including Lush Life, whose piano ornaments and low, chromatic descents are not unlike those in Billy Strayhorn’s own recordings; the gorgeously slow-rolling blues of Lover Man which, perhaps more than any other in this selection, picks up on Oscar’s delicious characteristics; and sumptuous harmonies in If I Only Had a Brain (from ‘The Wizard of Oz’), dancing to the crisp soft-shuffle of Farmer’s and Morrison’s rhythm. The changes in Frank Loesser’s ‘Slow Boat to China’ are a popular basis for new composition and, intentionally, those same climbing phrases in Latchin’s Off the Latch (‘grand title) are recognisable – an ebullient, sparkling showcase indeed. Trane Hopping – one of the pianist’s early blues, inspired by John Coltrane’s ‘Giant Steps’ – swings with great parity through the trio (a pleasure to hear the exuberance of Tom Farmer here, away from his more contemporary project adventures); and Blues for Billy, Latchin’s tribute to the great drummer Billy Higgins, feels like a memory of a favourite classic-in-the-tradition with its perky acciaccatura and major/minor piano personality. This CD has been spinning for some time… and never loses its sheen, nor its smile. Released on 15 September 2017, Introducing Gabriel Latchin Trio is available as CD or digital download at Bandcamp. clamour ■ n. a loud and confused noise. ■ v. (of a group) shout or demand loudly. IT WOULD SEEM rather off beam to suggest that this sextet resembled (in more conventional spelling) the above definitions; but they do provide a clue to their full-on, angular and often wondrously oblique approach to jazz. Rick Simpson is a regular sideman on the London scene, as are his colleagues in this line-up – and saxophonists Michael Chillingworth and George Crowley are no strangers on the front line together (see recent release Scratch and Sift), communicating no-holds-barred creative grit and energy. The prospect, then, of them melodically heading-up the pianist’s original, unpredictable compositions is something to relish, especially in collaboration with vibraphonist Ralph Wyld, bassist Tom Farmer and drummer David Hamblett. Simpson’s broad musical understanding and appreciation provides a solid basis for his writing, though improvisation is a key motivator (as much at home with the music of Kenny Wheeler as Django Bates, or as inspired by post-bop as free jazz). So in this project, the avoidance of structure doesn’t signal ‘clamour’, but rather that the zesty compositions offer his colleagues considerable freedom – and it’s notable how, throughout this near-hour-full box of delights, arranged phrases can either meld or snap into the wide-open spaces of individual extemporisation. The many rhythmic intricacies here must surely pose a knotty challenge, as evidenced in the first two tracks, Pins and Beware of Gabriel Garrick Imitators; and the furtive, jolting advancement of sax, vibes and bass (especially with Tom Farmer on board) resembles the excellence of Empirical. But, although Rick Simpson is happy to join the combined ‘klang’ of the ensemble, on Fender Rhodes, his pianistic inventiveness also regularly comes to the fore. So he shapes How Deep is Your Disrespect with the kind of sensitive, wayward fascination associated with John Taylor; and his ‘alarm’ ostinato in this number, picked up from Ralph Wyld’s vibes, is an attention-grabbing vehicle which sparks percussive excitement, as well as typical outlandishness from Chillingworth and Crowley (turn it up loud!). A pianist’s approach to composition can clearly be picked out in slow-moving, spacial Orbital, as lush alto and sax harmonies are complemented by nebulous, star-glinting piano and vibes which are then sumptuously swelled by the whole ensemble; and aqueous, tremulant Rhodes in Sea Change binds together the evolving, painterly layers of a jewel-encrusted canvas. The complexity of volatile, irascible Greasy Child! Ugly Man!, with its simple yet provocative double-horn jibing, is riveting; so, too, is bright, snappy Unsustainabubble whose straight-ahead tenor and bass hook-up is immaculately delivered. Rings End is packed full of undulating intrigue, somehow suggesting a comedic movie accompaniment; and the easy, South African lilt of Surreal Estate (almost ten minutes in duration) is just the prelude to a many-roomed promenade, crescendoing to a synth-enhanced climax. 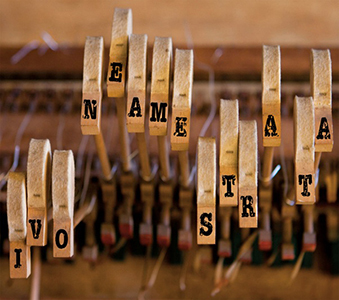 Shut out any other forms of, er, ‘klammer’… and revel in its spirited fullness. Released on Two Rivers Records, on 30 September 2016, and available from Bandcamp. ALWAYS pushing, always challenging… progressive UK quartet Empirical strike out on their own with fifth studio album, Connection. For almost a decade – and in this line-up since 2008 – Nathaniel Facey (alto sax), Lewis Wright (vibes), Tom Farmer (double bass) and Shaney Forbes (drums) have, in previous releases, sought to experiment and collaborate with other artists. But, as Farmer explains, “This time, we went into a great-sounding studio with just the four of us. Connection is an accurate representation of what we’re doing now, what our gigs sound like. This is our expression.” Indeed, by all accounts, their recent week-long ‘pop-up jazz lounge’ in a London Underground retail unit – an opportunity to introduce their sound to new audiences, for free – was a runaway success in terms of live jazz awareness and social media presence. Ten original tracks, mostly composed by either Wright or Farmer, find the band in typically spirited, spiky vein, crafting an acoustically raw edge to all they do. Card Clash is a great example of their consummate flexibility in communication, skipping from jagged dissonance into infectious, lucid swing; and whilst alto sax and vibes may be expected to be the principal melodic voices here, it is in fact the democratic and dynamic parity of all four musicians which is key to their appeal, as the snappy rhythms, false endings and lightning riffs of Nathaniel Facey’s Stay the Course prove. All manner of textures seem possible in this grouping, Lewis Wright’s vibraphone easily conjuring sustained ’60s MJQ (Lethe) or the effervescent brightness of Gary Burton (The Two-Edged Sword); and Facey’s alto can swing from hard-bop (Initiate the Initiations) to subtle exploration (Mind Over Mayhem). Yet the invention here is consistently contemporary, unpredictable and engaging. Announced by Steve Reichian clapping rhythms, Farmer’s The Maze darts, twists and flips to Wright’s similarly minimalist vibes repetition, picked up by the bassist with impossible rapidity; and Driving Force‘s burning mystery gradually unfolds across slowly-oscillating vibes, with Facey’s firecracker improv and Forbes’ brittle percussion breaking the smoothness of the surface. The surprises are fast-arriving across these fifty-three minutes, Anxiety Society possessing an almost Clouseauian/Shot in the Dark quirkiness, thanks to its bobbing bass undercurrent, cheekily ticking percussion and characterful, anarchic alto; and the delicate vibraphone pools and cascades of closing number It’s Out of Your Hands are especially becalming until their confluence with the fast-flowing eddies of bass, drums and alto sax. True to form, Empirical delight with their unadorned though particularly physical and creative approach to jazz, melding tradition with forward-facing fervour. Released on 18 March 2016, Connection is available as CD or download from Cuneiform Records’ Bandcamp page. THERE’S a school of thought that says you should never go back – y’know, that was then, and now is now. But thank goodness the rule book can occasionally, for all the right reasons, be ripped up and emphatically trodden into the ground! 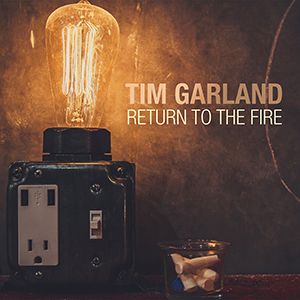 Back in 1995, rising British saxophonist Tim Garland began to put together and record his fourth solo project, Enter the Fire, with colleagues Jason Rebello (piano), Mick Hutton (bass) and Jeremy Stacey (drums), as well as bringing Gerard Presencer (trumpet, flugelhorn) into the fold; and the album was eventually completed and released in 1997. Garland recalls how, soon after, whilst staying at the New York apartment of vibraphonist Joe Locke, the pianist Billy Childs turned up – and, on hearing the album, requested a copy to give to a friend… who just turned out to be jazz icon Chick Corea. Thus began Tim Garland’s long friendship with Corea (quoted as saying of the saxophonist, “I wanted some of that fire in my band”) and consequently, many years of shared international success which show no sign of waning. Twenty years down the line, now greatly-renowned UK saxophonist and composer Garland has rekindled the excitement of that significant moment by re-connecting with the same personnel, along with guest appearances from newer names on the scene – Tom Farmer, James Maddren and Ant Law – plus respected bassist Laurence Cottle. The result is a new 40-minute recording which focuses on the revered (and now resurgent) era of vinyl, offering a combination of four originals and two arrangements which, whilst redolent of late ’90s and earlier acoustic strains of straight-ahead jazz, feel as relevant and as fresh as ever, especially with a final, more contemporary flourish. Tim Garland has long possessed an unmistakable signature sound – his assured vibrato and a no-holes-barred approach to lyrical phrasing, whilst also scaling the topmost heights of the register – and this album continually flows and coruscates to that potent combination, as well as affording the whole band the space to stretch out. Nine-minute opener Abiding Love achieves exactly that, its classic sound bubbling to the smooth meld of tenor and flugel against Rebello’s crystalline piano, which Presencer then cuts through with customary, tonally-bright trumpet improvisation. J.J. Johnson’s Lament is the perfect platform for Garland’s rich, characterful tenor lead (as the melodies begin to cascade freely, it really couldn’t be anyone else) with such a wonderfully spacial quality created by his quartet of Rebello, Farmer and Maddren. And title track Return to the Fire swings with unequivocal verve, led by Rebello’s sparkling runs – as if to proudly state “we’re back” – and certainly not withholding anything as Stacey’s deliberate drum rhythms cleverly shift gear into a pulsating final section. Beautifully inquiring Valse pour Ravel somehow suggests the freedoms of a Pat Metheny / Lyle Mays composition, with Garland taking an eloquent soprano lead over romanticised piano, and Presencer’s flugel dreamily intertwining or magically dancing in unison. McCoy Tyner’s sumptuous Search for Peace remains one of jazz’s most haunting melodies, and here it develops into a particularly engaging, near-ten-minute exploration as Garland’s tenor revels in its unhurriedness, with Rebello taking the Tyner role exquisitely. To close, All Our Summers ripples to complex bass clarinet and electric guitar riffs over jabbing Fender Rhodes (Garland an especially versatile and colourful exponent of the bass clarinet) in a groove that perhaps harks back to those early NYC days, and almost fading before its time. Released by Edition Records on 2 October 2015, Return to the Fire is available only in 12″ vinyl and digital download formats – at Bandcamp, as well as from online retailers and record stores. The lack of CD physicality might hinder some collectors, but this is a recording whose confidence, fluency and out-and-out jazz feel-good becomes irresistible. 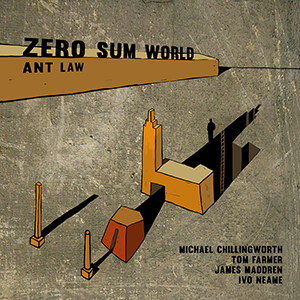 MARKING his debut release on the Whirlwind label, guitarist Ant Law’s second album Zero Sum World assembles something of a British contemporary jazz dream team to realise the frequently freewheeling adventure of his own eleven compositions. For the last fifteen years, Law has practised perfect fourth guitar tuning – symettrising string intervals by simply nudging up the top two by a semitone. As well as creating instrumental logic and order (Law is also an accomplished pianist), it also provides the opportunity to more readily develop and extrapolate ideas across the entirety of the fretboard, as well as offering subtle harmonic variation. Equal to this album’s creative challenge are Mike Chillingworth (reeds), Ivo Neame (piano), Tom Farmer (bass) and James Maddren (drums), Neame being the only line-up change from 2013 release ‘Entanglement’. As both composer and instrumentalist, Ant Law takes an inquiring approach to his music – not unexpected, given his higher education in Physics (Google ‘zero-sum game’ for a clue to the album title) – which is evident as each of these extended numbers unfolds; and it’s this broadness which coaxes the listener in to discover more of its beauty (definitely not a lite gallop through standards or radio-friendly ‘choons’). So, a sense of evolution is illustrated in the title track as it widens from Chillingworth’s solo sax line into overlapping chordal atmospheres created by Law and Neame; and, against the intensifying bass and drums urgency of Farmer and Maddren, guitar and sax share unison lines as well as developing their own improvisations. Law is showcased more prominently in Waltz, its memorable riff encouraging his deft guitar colorisations as well as characteristic piano invention from Ivo Neame (a thrill to hear in any line-up); and Mishra Jathi is an early highlight, delivering a seven-beat bass/piano/drum propulsion (reminiscent of Kairos 4tet) with an effective amalgam of instrumental textures and solos. The initial dreaminess of Asymptotes gives way to a perky descending bass motif which sparkles especially to Ivo Neame’s lithe piano against Law’s guitar washes, whilst Parallel People‘s buoyancy is infectious, Chillingworth’s alto chromatically dancing around the band’s impressive maelstrom. In Triviophobia, the mellow-yet-sprightly tone of Ant Law’s guitar (with echoes of Wes Montgomery) swings out to Farmer/Maddren assuredness, as does the polyrhythmic quirkiness of Leafcutter and the shadowy nursery rhyme-like Symbiosis with its wonderfully twisted agility and the woody sonority of Chillingworth’s bass clarinet. At nine minutes’ duration, statuesque Monument is dedicated to American guitarist Ben Monder, it’s underlying prog predilection pointing to the likes of early Genesis, plus mischievously free improvisation and jazz phrases reminiscent of Kit Downes’ solo releases (perhaps that’s the woodwind). The closing Blues is characterised by effective cantabile double bass and guitar, as well as Neame’s mastery at the piano – all topped off with a tantalising BB King-style fade-out! Ant Law’s ‘magic eye’ artistry here (my description of the enlightened, three-dimensional experience to be found when delving deeper) is greatly rewarding to hear again and again. Indeed, a recent disparaging, left-field commentary on this album, having caused consternation but mostly hilarity amongst the jazz fraternity, indicates that it’s worth developing the listening skills to fully appreciate this quintet’s rich musicality! Released on 16 February 2015, visit the dedicated Zero Sum World page for more information, audio clips, promo video and purchasing. 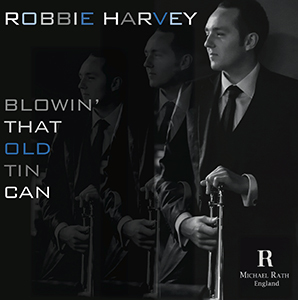 A SPLENDIDLY straight-down-the middle album from trombonist Robbie Harvey, Blowin’ That Old Tin Can celebrates the less-frequent jazz leadership of a particularly lyrical and exciting instrument. With an impressive background – including tutelage by Denis Wick and lead trombonist with NYJO, as well as numerous international awards and high-profile big band appearances – Ronnie Scott’s regular Harvey now releases this fine debut recording. Joining him on an eight-track outing of standards and originals is the wonderfully buoyant team of Alex Garnett (tenor sax), Leon Greening (piano), Tom Farmer or Giorgos Antoniou (double bass), and Steve Brown (drums).